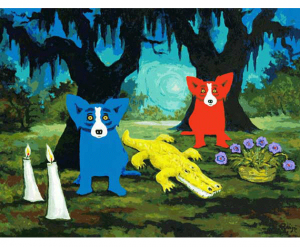 Thank you for your inquiry regarding appraisals on your artwork by George Rodrigue. Because of the fluid nature of the art market, Rodrigue Studios is unable to appraise or authenticate artworks. We highly recommend that an accredited appraiser be contacted directly. In order to avoid any regrettable decision when getting your artwork appraised, be sure to choose an accredited or certified appraiser from one of the three main accrediting bodies in the United States: AAA, ISA and ASA. All three organizations provide rigorous training for art appraisers, and require a training course and exam for accreditation, and all three require their appraisers to stay current with the Uniform Standards of Professional Appraisal Practice (USPAP). Fees may vary, and are often based on the number of pieces, or an hourly rate (but never on the value of your artwork). If you purchased your work from Rodrigue Studio in the past, your sales receipt functions as a certificate of authenticity that will help the appraisal company appraise your piece. New certificates of authenticity cannot be issued for works previously sold. However, all works currently sold by Rodrigue Studio will be accompanied by a certificate of authenticity certifying that the work was bought directly from the George Rodrigue Estate. If you have an original one-of-a-kind work on canvas, the Rodrigue family is interested in documenting those works in preparation of a catalogue raisonné of George Rodrigue’s entire life’s work. Please contact us at info@georgerodrigue.com if your piece should be included.